The Gypsy King Tiger Pleco (Hypancistrus sp.) also called the King Tiger Pleco comes from the lower Rio Xingu and Tocantins in Brazilian South America. 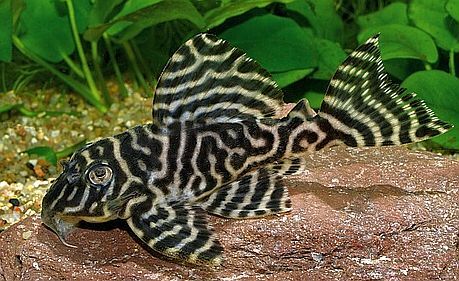 The Gypsy King Tiger Pleco is a distinctive L number that is frequently confused by tropical fish keeping enthusiasts with other similarly patterned species (L333, L318, L399, L400 and L401). Young Gypsy King Tiger Plecos are colored differently than the adults however, both have a light base (usually tan) with dark lines or dark brown “tiger” stripes covering the entire body and fins. The Gypsy King Tiger Pleco (L066) has even, straight lines in the fins; other similar fish do not. The eyes are also striped and follow the markings on the head. The males have a more distinct color pattern and are a little darker. They also have longer odontodes and more bristles on their pectoral spines. Males also acquire quite a few more fine spines on their bodies. Females have more “mass” when viewed from above but both sexes get pretty well rounded when in good condition. Gypsy King Tiger Plecos make great additions to any South American community aquarium. Although they get somewhat territorial with others of their own species, they are peaceful and do well with small tetras, corydoras, etc. The Gypsy King Tiger Pleco prefers good current with high oxygen levels. An aquarium planted with hearty, fast growing plants is not absolutely necessary for these Plecos. In their native habitat, the Rio Xingu, the water is extremely warm (80-84F) and has a high oxygen content. The substrate in the Rio Xingu is made up of stone and sand, and aquatic plants are rare to nonexistent. Although an aquarium aquascaped with rock caves and lots of driftwood will keep them healthy and happy, a few plants never hurt. Gypsy King Tiger Plecos max out at about 6″ in length and should be housed in at least a 30 gallon tank. Adding a powerhead is a must to provide the necessary water movement required by these fish. Fortunately, the Gypsy King Tiger Pleco has recently been bred in an aquarium setting. The spawning pair need naturally soft, acidic water (from the driftwood ) and the water temperature kept at 84 degrees. Performing a 40-50% water change about every two weeks may induce spawning activity, and feeding them a diet of sinking carnivore pellets also helps. The male will keep the female “trapped” in a “cave” until spawning occurs and a clutch of eggs are laid (usually at night). The male will continuously fan the eggs until they hatch (in about a week) and will continue to fan the fry until the egg sacs are absorbed (about two weeks). At this time, if you can get the male out of the cave, you can separate the fry and move them to a rearing tank. The fry can be successfully raised in a bare 10-gallon tank with a couple of seasoned sponge filters. As the fry grow larger, feed them algae, algae wafers, and shrimp pellets. The young are sensitive to nitrates, water changes, and being placed in a different tank; so you might consider just leaving them alone with the male to raise them. Since they are carnivores, feeding the Gypsy King Tiger Pleco is not difficult. They get most of their nutrition from left over food on the bottom of the aquarium, from algae, and from other tidbits on the bogwood. Their diet should be supplemented with bloodworms, mussel, tubifex , shrimp pellets , carnivore wafers , and prepared sinking foods such as Tetra Bits, etc. Gypsy King Tiger Plecos when available for purchase are 2″ to 3″ long.